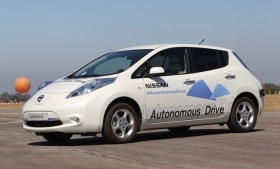 Nissan has been working on self-driving vehicles for years at its Japanese r&d centers. Nissan Motor Co. today said it intends to have multiple self-driving vehicles ready for retail sale in 2020. The assertion shows the Japanese automaker pushing ahead on a promising new technology. But the sale of self-driving vehicles could be derailed by federal traffic safety regulators. Nissan has been working on self-driving vehicles for years at its Japanese r&d centers, and now plans to step up its investment in the technology, including a new proving ground dedicated to autonomous vehicles. The company also recently opened an advanced technology center in California's Silicon Valley that is working on autonomous vehicles. Other automakers also are working on self-driving vehicles, which would allow drivers to take their hands and eyes off the road and rely on technology to safely guide the vehicles. But many proponents say that significant hurdles -- including federal safety regulations -- remain before the vehicles can go to market. Nissan's announcement is carefully worded to say that it will have vehicles ready in 2020 -- not that the cars will be in Nissan showrooms. The difference is regulatory uncertainty. Before any automaker can put self-driving cars on the road, a host of regulators will have to agree on the rules. Issues surrounding the science are far from resolved in 2013. One typical question: What happens to an autonomous car during a driving emergency? Engineers say the vehicle will signal the driver to take over manual control of the vehicle. But if the driver is temporarily incapacitated and can't re-take control, the vehicle will be forced to stop. In such an event, there will have to be specific regulatory guidelines for moving a disabled car to safety on roads of every condition and description. Other unresolved issues involve insurance policies, law enforcement and vehicle communications technology. "We're saying that we have the technology and we will be ready to market in 2020," says Dave Reuter, Nissan Americas spokesman. "There will be an ongoing maturation of the technologies over the next few years. "We will have a fully functioning test track in operation by the end of our next fiscal year that will be dedicated to this field. And the more miles we put on our test vehicles, the more knowledge we will gather to be ready."